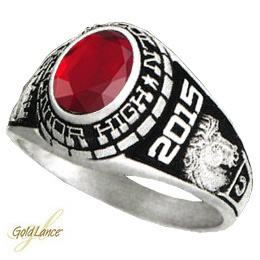 The girls junior high school class ring features a 8mm x 6mm oval stone. Personalize it with your choice of activity, school mascot, name and graduation year. The ring is handcrafted in the USA by Gold Lance. Ring top width: 12mm.